Brrr it’s getting a bit chillier. I was particularly joyous when I woke up yesterday to look out of the window and see that the car was iced over. That extra 10 minutes to scrape the ice off the car nearly derailed my ‘get The Child to school on time’ mission. It was probably only actually only a 5 minute job but it took a longer as I had to first locate the scraper and then wrestle it out of The Child’s hands to do the job properly whilst offering encouraging words as to what a good job he had done scraping all the low down bits which I wouldn’t be able to see out of anyway. We made it by the skin of our teeth, he was in the door with 1 minute to go. The whole morning had gone poorly as far as time management was concerned. It was my own fault for hitting the snooze button on my alarm twice which meant I was now 20 minutes behind but when it’s dark and cold I just cannot drag myself out of bed. Not to worry though we were washed and dressed in fairly good time, so downstairs for breakfast whilst I do a speed packed lunch. Ah, the infernal packed lunch. On the plus side it means that I get to control what The Child is eating and ensure that he is eating enough and has a balanced diet. On the downside I have to try and come up with new and creative ways of varying the offerings and I have to make it. I try to vary the sandwiches every day, add chopped vegetables and some fruit. Maybe a yoghurt as well for good luck. Not too complicated right, well no, not as long as you have the required ingredients to hand. But yesterday, aaaaargh I had run out of bread. However, I have a new weapon in my arsenal to enable me to complete the ‘get The Child to school on time’ mission. 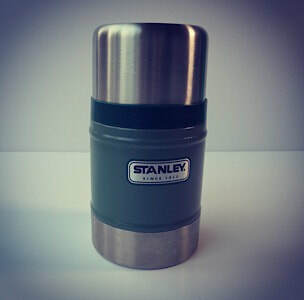 The Stanley Vacuum jar. This is a short, fat insulated flask with a wide enough mouth so that you can easily get food into it, and it fits in the packed lunch bag. Hoorah! The top is big enough to use as a bowl and The Child assures me that the food is still warm by the time he comes to eat it. Well this is a game changer. I managed to rustle up some pasta and pesto in just over 10 minutes, so we were back on track. I have also tried spaghetti bolognese and now I am thinking I could also do a beef stew, chicken casserole, soups - I could just reheat these and put them in the flask! oooh exciting… The Stanley Vacuum Jar gets a big tick from me and a big tick from The Child.